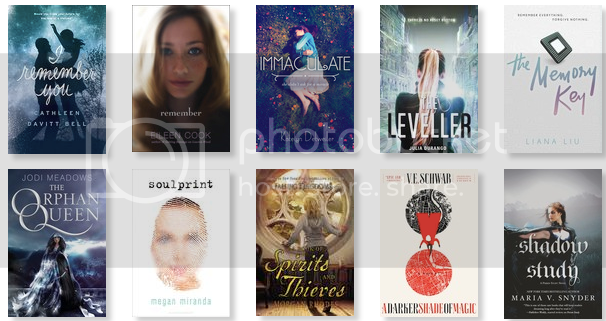 This week's topic from The Broke and the Bookish is: Top Ten Books You're Looking Forward to in 2015. Normally, I'd have trouble narrowing it down to just 10, but I've been feeling very choosy lately! Here are the ones that looked really appealing to me. Sounds a bit timey-wimey, with a teen romance imperiled by memories of the future. A girl uncovers a conspiracy with her father's memory erasing company. A virgin finds herself pregnant... and no one believes her. A bounty hunter is hired to deprogram teens addicted to virtual reality. In a dystopian world where everyone is losing their memories and must rely on a memory chips, a girl starts to doubt that her memory chip is working correctly. Sounds like high fantasy with an imprisoned magical princess spy. A girl is imprisoned because it's determined that she is the reincarnation of a famous criminal. High fantasy, with travel between modern-day Toronto and and ancient fantasy kingdom. Fantasy which alternates between two very different Londons in the multiverse. A new spin-off of the Poison Study series.